A fudge is a rich candy made with sugar, milk, butter and flavoring. In this recipe I have made two layers by giving a touch of indo-western as the mango layer is made from mango pulp and it’s the most common seasonal fruit in india and chocolate is from western confectionery. I haven’t used any butter and sugar here instead used low fat condensed milk which makes the treat rich. 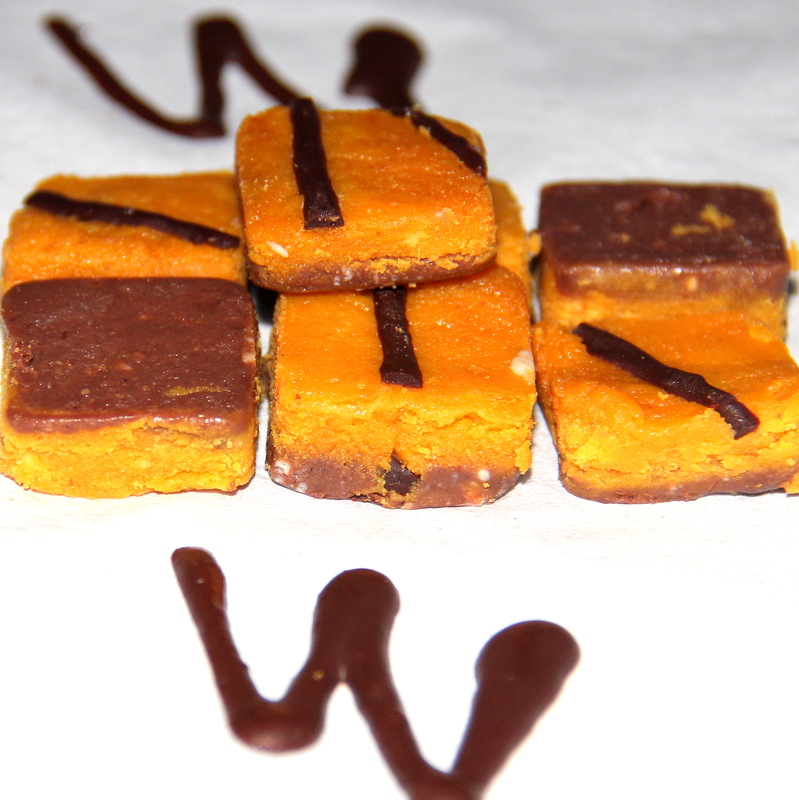 Flavorful mango fudge layer is coated with bittersweet chocolate layer; topped with melted chocolate. It is simple and delicious recipe. Line 8×8 inch pan with parchment paper and set aside. In a bowl combine condensed milk and mango pulp, and the pour it to a non-stick wok/pan. Place over a medium heat and cook, stirring continuously, until reduced to half. At this stage add vanilla essence, milk powder 1 cup milk powder little at a time stirring continuously ensure no lumps are formed. Taste the mixture at this stage and if you feel more sweet is required add brown sugar/ sweetener and continue to cook on a low flame. if the mixture starts leaving the sides of the pan then its almost done. If its still liquid then add some more milk powder and mix well until the smooth dough consistency is formed . Turn off the heat and transfer it to the lined pan and spread evenly and set aside. In a pan over low flame combine condensed milk, chocolate and heat until chocolates are melted and smooth. spread this mixture on top of mango mixture and smooth evenly. Refrigerate until set about 2-3 hours. Once set decorate it with melted chocolate/nuts and cut into small squares. I added just condensed milk for sweetness but if you love more sweet in your fudge go ahead and add sugar/ any sweetener. In chocolate layer if you don’t like the bitterness use milk chocolate. Quantity of milk powder can be reduced/ increased depending on the pulp and the duration of cooking (If you add less milk powder it takes longtime to get thicker). I am posting this recipe to Fiesta Friday #23. Posted on July 4, 2014, in Dessert, Indian, International, Kids recipes, Sweets and tagged Chitras healthy kitchen, Choclate and Mango fudge, drchdietfood, Healthy fudge, Indo-western fudge. Bookmark the permalink. 27 Comments. Haa haa….Thank you…It was a nice combination and came out well. I love chocolate. I love mango. This looks so yummy. I wonder if it’s possible to veganize it. my favourite MAgoe 🙂 I am coming over Mam…..
Mango and chocolate sound divine mixed together, I have to try! Thanks a lot for this cute and original recipe, it will be very appreciated at FF! Yummmm, anything with mango and condensed milk has got to be good. Yours looks amazing!